The Bureau of Justice Statistics, in collaboration with the National Center for Education Statistics, has released "Indicators of School Crime and Safety: 2013." 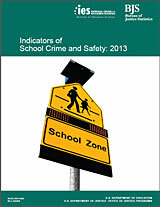 This annual report provides the most recent data on school crime and student safety. The indicators in this report are based on a variety data sources, including national surveys of students, teachers, principals, and postsecondary institutions. Topics covered include victimization at school, teacher injury, bullying and cyberbullying, school conditions, fights, weapons, availability and student use of drugs and alcohol, and student perceptions of personal safety at school.